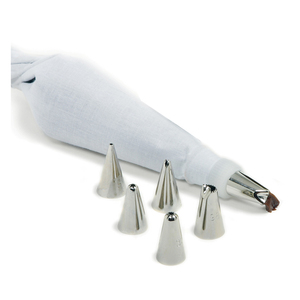 Dessert decorating set for creating beautiful cakes, pastries and more. Great for beginners and experienced decorators alike. Set includes; 6 tips, 1 reusable pastry bag and 1 reusable coupling. Recipes and instructions are also included. Hand wash all your decorating pieces. 6 tips, 1 pastry bag and 1 coupling.